The design of the XPS 13 is the first thing you see, and you would be hard pressed to find anyone who does not think Dell has done a great job with the overall intention. From the external aluminum shell, to the carbon fibre palm rest, to the super thin bezels, the XPS 13 is undeniably a great looking laptop. Dell has really squeezed the dimensions down for this device. To say that it is a 13 inch laptop in an 11 inch chassis, we should see just how close they got. 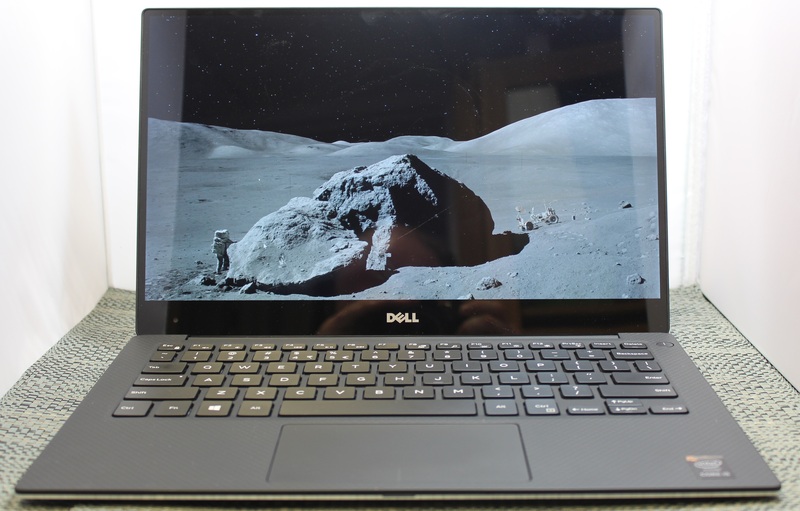 The Dell XPS 13's dimensions are listed as 11.98 inches (304mm) wide, and 7.88 inches (200mm) deep. Compare this to the MacBook Air 13, which is 12.8 inches (325mm) x 8.94 inches (227mm), and right away it is clear that the Dell is quite a bit smaller. The MacBook Air 11 is much closer in size, at 11.8 inches (300mm) x 7.56 inches (192mm). So truly, the lack of display bezels has changed what we would think of as a 13 inch laptop. If more devices go this route, which they likely will, there will be much more display per unit of laptop going forward. The outer shell of the XPS 13 is completely aluminum, on the top and bottom. This gives the design a premium feel with the very first touch, and compared to the plastic of most notebooks, it is a big step up in terms of materials and finish. While not milled out of a single piece of aluminum, the exterior looks and feels very nicely made. With the notebook closed, there is a black strip around the center, which gives a sharp contrast. Dell paid attention to the bottom of the device as well, with a magnetic plate, hinged on one side, covering the service tag and serial number to keep the bottom looking clean and unblemished. The left side features the mini DisplayPort output, as well as a USB 3.0 port with PowerShare (you can charge devices while the laptop is powered off) and the headset jack. The speakers are on the sides on the XPS 13, so the left has an unobtrusive speaker grille as well as the battery meter. The right side features another USB 3.0 port, also with PowerShare, as well as the Noble lock and the SD card slot. The second speaker grille adorns the front right of the notebook. The front of the laptop has a single light, which glows when the laptop is charging and flashes yellow when the battery is critical. This makes it easy to tell when the laptop is fully charged and is a nice addition. 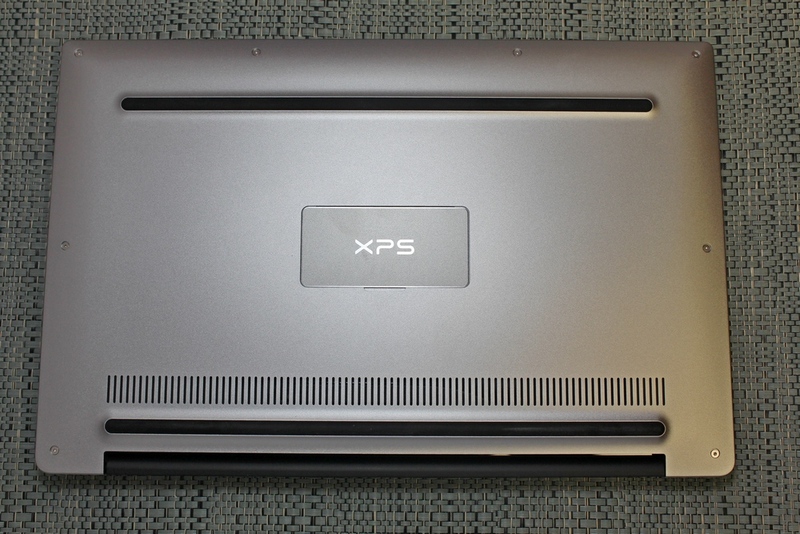 The underside of the XPS 13 consists of two full width rubber feet. This makes it plenty sturdy to use on almost any surface and keeps the device stable even on uneven surfaces. The fan intake and exhaust is also under the laptop, which helps keep the noise of the fan at bay. Yes, there is a fan. Broadwell-U promises to be more power efficient, but it is still rated at 15 watts so that heat must be removed. Once you open the XPS 13, you will be face to face with the wonderful display, which takes up almost the entire width of the device. With bezels only 5.2 mm thin, Dell is marketing this as an Infinity Display, and while it is not quite the same as an Infinity Pool it is still a great effect. Laptop bezels have been quite large for a long time and this new device will hopefully usher in a push to smaller bezels on all laptops. The XPS 13 does have a larger bezel at the bottom, which serves a couple of purposes. The extra height allows Dell to keep the depth of the laptop larger, which makes more room for the trackpad, and the front facing camera also finds its home in the bottom bezel. This does make it less effective though, and perhaps Dell can find a way to squeeze it back on top without adding too much thickness to the top bezel. The keyboard is an island style, completely surrounded in carbon fiber. This is then covered with a soft touch paint, which makes it a lot more comfortable to type on than something with an aluminum top and sharp sides. The weave of the carbon fiber still shows through and gives it a great look. The keyboard itself is also quite good for an Ultrabook and the small travel that they entail. The key layout is also fairly standard, and while I prefer dedicated Page Up/Down, Home , and End keys, that would be tough to do on a laptop this small without sacrificing something else. The up/down/left/right keys are well placed and easy to use. 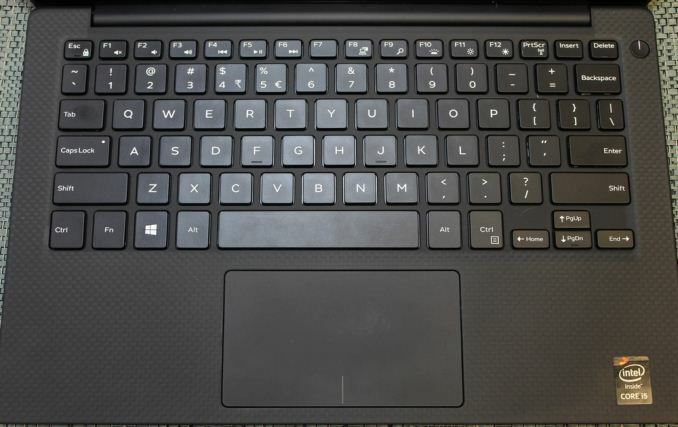 Below the keyboard is the clickpad. Dell has opted to forego the third party drivers and sticks with the Microsoft Precision trackpad model. This moves the settings into Windows and makes them more consistent. 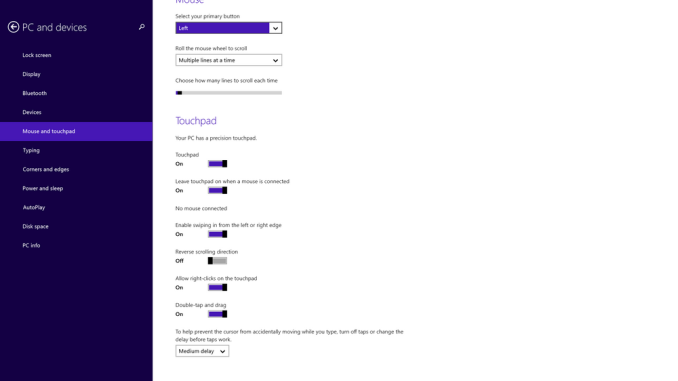 There seems to have been no issue with doing this, as the clickpad was responsive and accurate. I do prefer dedicated buttons, but on a device this small that would take away too much trackpad space, so a clickpad is the better choice here. Overall, Dell has created a great design in the XPS 13. It keeps with some of the Dell traditional designs, but the sharper edges and smaller radius corners contribute to an overall better look. That coupled with the premium feel of the materials, the good keyboard and trackpad, and the very small display bezels, make the XPS 13 one of the more attractive laptops around. Just something to be aware of. Anyone with knowledge of structural integrity etc. would avoid putting a hole in a brittle substance near to a point of frequent stress. It seems that laptop manufacturers aren't too clued up on this. The last one I got handed from a customer with a cracked touch screen took three visits from Dell to fix. Pretty solid offering from Dell. I like the i5, 8GB, 256GB, QHD+ model but the price is just too high. The configuration that interests me is the i5, 8gb ram, 256gb ssd, FHD model which on Dells website is $1099. Problem is I can get a Surface Pro 3 i5, 8gb ram, 256gb ssd, QHD model for $1199. No, they don't. The improved battery life (rougly 50-200% better) of the XPS 13 alone makes up the cost difference. Price is not too high. This is a very nice machine, and worth the money, no question. I'd have an i5, 8GiB, 256GB, FHD version. Stupid QHD+ eating FIVE hours of battery life, screw that, waste of time.